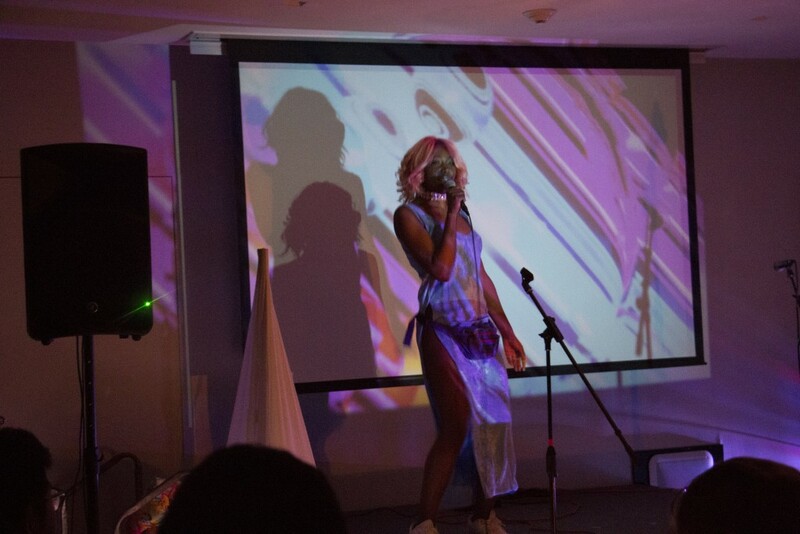 Ramapo Music Club hosted an album release party for student rapper Empty Matrix’s new album “Centipede” at the New Alumni Lounges. Throughout the party, student rap acts B and DeathIRL performed sets, as well as the south Brooklyn rapper and producer Azia. In addition to performing, Empty Matrix also emceed the night’s events, inviting performers on stage and raffling off a variety of prizes, including restaurant gift cards and dorm essentials like boxes of cereal, ramen noodles and Tide pods. A few students won CD copies of “Centipede” with detailed original artwork by Empty Matrix and t-shirts that were designed by her sister. Empty Matrix cited southern and eastern rappers as her most significant musical influences, but she is also inspired by larger concepts that involve nature and space, which are all on full display on “Centipede’s” dark mysterious album artwork. Songs like “Catalyst” and “Rusty20” are washed in dreamy atmospheric instrumentals, driven by cycling ticks and whirling synths. “I recorded every sound on the album, I mix-mastered, engineered, entered it on copyright.gov, it’s all DIY,” she said. Charles Pfrommer jumped on stage to perform a few songs with Empty Matrix. Pfrommer, known by his stage name DeathIRL, delivered extremely energetic industrial hip-hop songs, full of political and historical references. Dressed from shoulder to toe in a vibrant “My Little Pony” themed overcoat, Azia explained her nostalgic affinity for the television show. She said, “It’s just a really cool show. It has really great music, and really great color, great concepts.” Azia is preparing to release an album of bouncy trap music titled “Soak Up the Sun” in the near future. Empty Matrix’s new album “Centipede” can be purchased directly through Bandcamp. The music club’s next big event is the indie music show on April 22 and their next open mic night will be on Thursday, March 29.